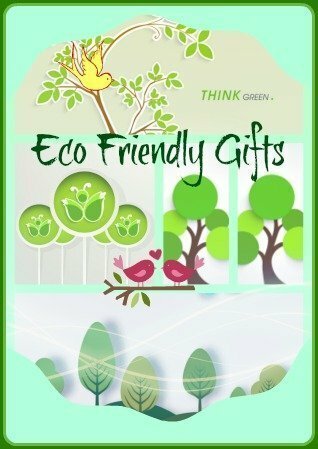 For those who are into sustainability and caring about the environment, then eco friendly gifts for mom, Christmas, birthdays or housewarming would be the answer when buying presents. Environmentally friendly gifts can be thoughtful, meaningful and useful. These sustainable gifts minimize wastage, save money, save water, use recycled materials, operate with renewable energy and reduce your impact on the environment. Actually there are plenty of eco friendly products, clothing etc. that are useful and support a sustainable lifestyle. Here are some green gift ideas that would appeal to the environmentally conscious. Reduce your carbon footprint and do your bit to save the planet with these unique eco friendly gifts. Planting trees help to offset carbon usage in an efficient way. Have you ever thought of gifting trees to those you love? Or using gift trees as wedding favors or table centerpieces? Arbor Day Foundation has a wonderful collection of gift trees that include a choice of spruce or pine varieties as well as fruit trees. You will be given a recommendation of the tree that will grow best in your area. 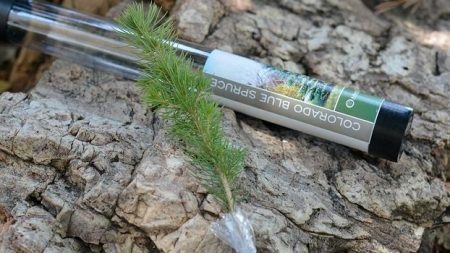 These gift trees are live plants presented in poly tubes and come with planting instructions. Just imagine, your gift will provide a lifetime of memories as the tree grows in the garden or backyard. Beautifully crafted eco friendly decorative items for home make wonderful gifts for environmental conscious home owners. Made from reclaimed or recycled materials and made without chemicals, they make unique memorable housewarming gifts. I’m sure you’ll love these as much as I do. 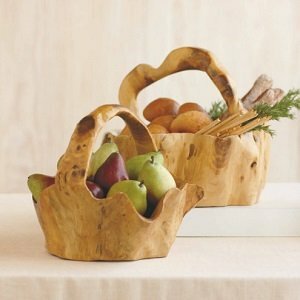 These truly beautiful fruit baskets are hand-carved from sustainable, reclaimed Chinese fir trees. Each has its own unique shape carved according to the shape of the original reclaimed wood. Besides these fruit baskets, there are also bowls, platters and serving trays made from these reclaimed fir trees. 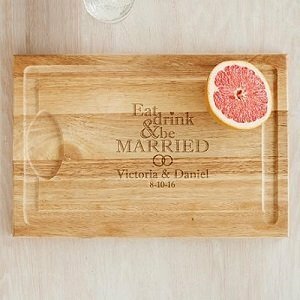 If you’re looking for rustic gifts, these would be perfect. Add them to your own collection, display them as table centerpieces for an elegant rustic ambiance to your home decor. 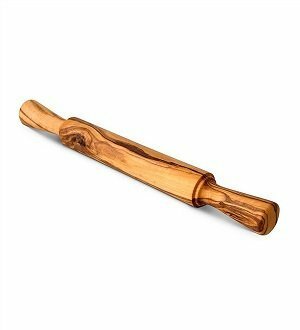 The olive wood rolling pin is handcrafted using sustainably sourced Italian olive wood. These olive trees have stopped producing olives and are around 350 – 700 years old. Besides the beautiful wood grained rolling pin, you can also get the olive wood sugar bowl, cutting board and olive wood salami cutter with knife. Functional, eco-friendly and artisan made recycled teak furnishings add a touch of sustainable beauty to your room. 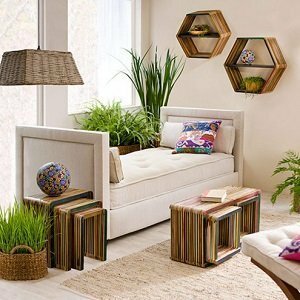 Choices include a set of three nesting tables, a set of three nesting cubes, or a set of two hexagon shelves. Or get all 3 sets for a complete sustainable look. These eco friendly night lights are made from specially treated recycled glass. 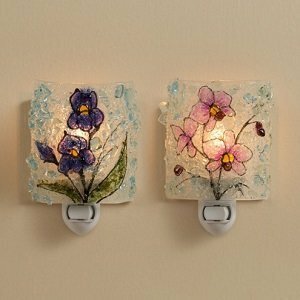 These colorful and pretty floral nightlights are made in USA. Discarded glasses are crushed and then fused in a kiln to make these artistic nightlights. Make pretty the dull wall in your hallway with these pretty eco friendly lights. These measure 3.5″W x 2.5″D x 5″H. If mom is a cat lover, then this recycled glass autumn cats nightlight will surely delight her. 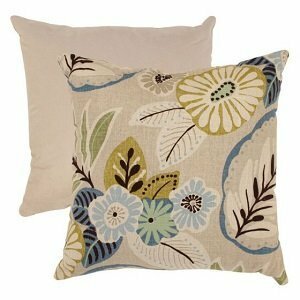 This 18″ x 18″ square beige and blue tropical decorative throw pillow comes with 2 style options. Reverse the floral printed side to reveal a solid beige background. With its floral design and soft beige background, this eco friendly pillow brings with it a feeling of fresh air and the outdoors. The inside is made of earth-friendly 100% virgin recycled polyester fiberfill. It measures 18″ x 18″. This is an eco friendly coir mat that is woven from 100% natural coconut fiber with fade resistant, colorfast dye. Coir is a natural fiber that is extracted from the husk of coconuts. This fibrous coir is durable and weather resistant. Its thick fibers enable it to absorb moisture easily and has skid resistant properties. The welcome mat has a recycled rubber back layer. It measures 28″W x 16″H x 0.4″depth. 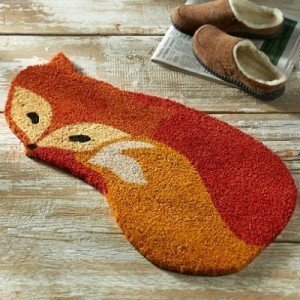 This fox shaped mat is made of coir, a strong, eco-friendly natural fiber that resists water, mildew and bacteria. This unique shaped mat with its vibrant colors would make a lovely welcome door mat. It measures 28″ x 16″. This cute and adorable eco friendly mat would make a lovely housewarming gift. The basil eco planter would appeal to home cooks, mothers and the health conscious. 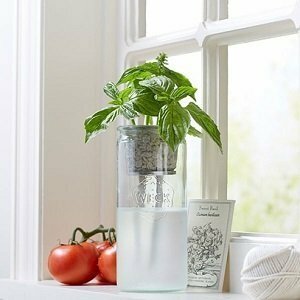 This self watering herb kit ensures that you’ll always have a supply of your favorite healthy herb in your kitchen. The package includes a glass jar, hemp wick, stainless-steel pot, earth-friendly growing medium, and Thomas Jefferson Historic Plants basil seed. Made in USA, this reusable kit with the passive hydroponic system makes herb growing hassle-free. Besides, it makes a great window decorative item too. Grow your own fresh organic mint, basil and cilantro herbs with these complete kits that include seeds, soil and growing containers made of 100% recycled tea bags. Each kit includes grow container, organic seeds and organic soil. The kit measures 5″W x 6.8″L x 10.3″H each. Such a delicious thoughtful gift for mom who loves to cook and grow her own herbs too. Each knife storage block is filled with a collection of eco-friendly bamboo skewers that will keep your knives secured without dulling them. 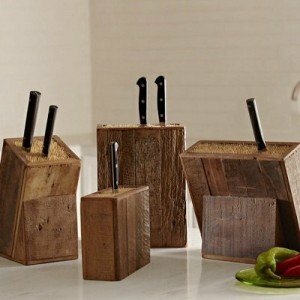 Outside, the knife block is crafted of sustainable, reclaimed wood with a weathered, worn look. Pair it up with sustainable Italian olive wood cutting board and you have a lovely useful eco friendly gift set. This eco-friendly sustainable maple wood cutting board is made in USA. It has a deep moat around its edges to collect juices. It measures 18″L x 12″W x 3/4″H. You can choose to engrave 2 names plus a date. 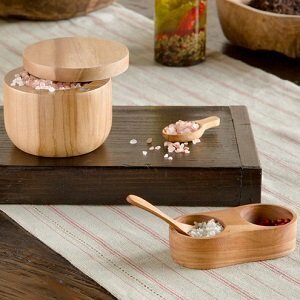 You have a choice of untreated recycled teak wood salt and pepper cellar or a recycled teak lidded salt keeper. The salt keeper comes with a swiveling magnetic lid and a scoop. It has a 4.5″ depth. The cellar has 2 wells and measures 4″L x 1″W x 1.5″H. 2 spoons are included. These recycled teak salt and pepper keepers would make your eco conscious mom very happy indeed. Handcrafted by artisans, recycled glass jewelry pieces are hand-cut, kiln fired overnight, and ultimately emerge with the timeworn look of genuine sea glass. The recycled glass pieces are affixed to thin wires or dainty chains, which are either gold-filled metal or sterling silver. 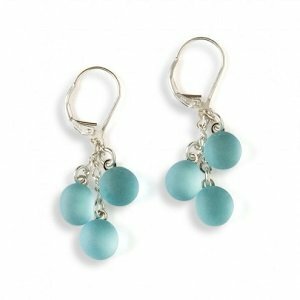 These three stone sea glass earrings are available in various colors. These beautiful lifelike flowers with vivid colors are handcrafted from reclaimed metal by Indonesian artisans. Brightly painted and full of life, you get a choice of sunflower, tulip, daisy or hibiscus. These beautiful flowers will spin on their axis whenever the wind blows. These 3′ tall flower wind sculptures feature emerald green “stems” accented with leaves as their sturdy stakes. The colorful flower metal wind spinners with spinning petals make a lovely sight in your garden or walkway. 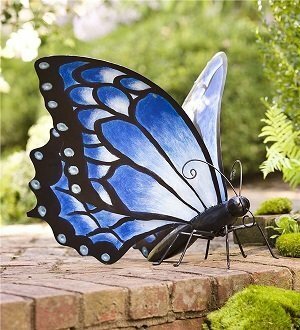 The large blue metal butterfly makes a bright splash of blue in your green garden, eye catching and pretty with its large vivid blue wings. Resembling the markings of a monarch butterfly, the hand painted blue wings are attached to the metal body with its curving antennae. It is made from reclaimed metal. The metal is cut by hand and no 2 butterflies are exactly alike. It measures 25½”L x 24½”W x 17¼”H. How about getting mom the all-weather, eco-friendly folding arm chair for a relaxing outdoor break from housework, surrounded by beautiful flowers and her aromatic herb garden. 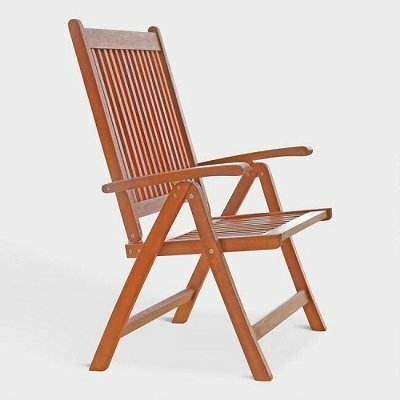 This relaxing arm chair is crafted from pre-treated, expertly kiln-dried High Density Eucalyptus wood certified by the Forest Stewardship Council. It comes with 5 reclining positions, a high back, and a wide slatted seat with comfortable arm rests. Mom will be pleased to know that it is mold, mildew, fungi, termite, rot and decay resistant. The arm chair can be used indoors or outdoors. It measures 18″W x 22″D x 41″H; 27 lbs.